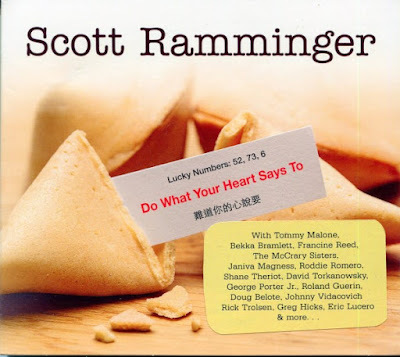 I just had the opportunity to review the most recent release, Do What Your Heart Says To, from Scott Ramminger and it's a gumbo of great tracks. Opening with mambo, Living Too Fast, George Porter Jr. on bass and Doug Belote on drusm set a great table for Scott Ramminger's vocal and sax work. David Torkanowsky dresses the track nicely with super piano work, joined by Eric Lucero on trumpet, Rick Trolsen and Greg Hicks on trombone and Shane Theriot on guitar. Great opener. Really slamming the New Orleans feel, title track, Do What Your Heart Says To finds local grown(Phoenix) talent Francine Reed joining Ramminger on a great duet. Scott is up front on sax and Torkanowsky's piano work is strong. Funky, Give A Pencil To A Fish, really has a serious groove with excellent key work by Torkanowsky and super punctuation by Theriot and Ramminger on sax. Ramminger's vocals are really nicely complimented by the McCrary Sisters making this one of my favorites on the release. Strong blues ballad, Winter Is Always Worse, nicely showcases Ramminger's vocal work and Theriot, guitar work is crisp leading to warm sax solos as well. Another funky track, Get Back Up, has a great drum line and cool trumpet with Ramminger again joined by the McCrary Sisters. Rich sax soloing by Scott, nicely riffed guitar work by Theriot, and cool organ work by Torkanowsky sets the main stage but it's the wildly woven trumpet, guitar, and vocal additions that really make this track sing. Janiva Magness sits in with Ramminger on It's Hard to Be Me and the track has that rolling drive that I associate with Elvin Bishop. Excellent New Orleans street style, Mystery To Me, is a terrific track featuring Tommy Malone. This track gets me just based on the excellent drumming by Belote and the trumpet work by Eric Lucero. Wrapping the release is Stubborn Man featuring Roddie Romero on accordion. This track has just a little more Cajun flavoring due to Romero's work but this track is totally consistent and a great wrapper for an excellent new release.